Ghanaian music star, Samini was recently in Ghana International School (GIS) on a surprise visit to the cast of the forthcoming school production, FAME. Eighty students of the school are deep in rehearsals for the much-anticipated show which is taking place at the National Theatre on Friday March 25 and Saturday March 26. The production is a stage adaptation of the hit American musical, which is centred on the lives and dreams of performing arts students. This is the first time FAME is coming to Ghana. It is produced in association with MTN and when MTN Icon, Samini heard about the hard work and dedication the young cast were putting into the show, he decided to surprise them with a visit and give them some helpful hints and tips. The star spent more than half an hour talking to the students and encouraging them. There will be a glimpse of Samini’s visit and more of the action on Metro TV’s FAME FEVER this Saturday at 1.30pm. 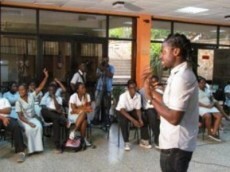 In this week’s episode, viewers will see Samini and hear the advice he gives to the GIS students. Viewers will also get to watch the cast give a short performance to the celebrity. Ticket for the live show at the National Theatre are selling at Ghc15 for adults and Ghc10 for students at GIS, Pippa’s Health and Fitness Centre, Silverbird, Black’s Secret Make-Up Bar in Osu. All audience members will receive Ghc2 MTN credit FREE when you produce your ticket at the gate. FAME is sponsored by Pippa’s Health and Fitness Centre, Ashki, Black’s Secret Make-Up, the Daily Graphic, Metro TV, Joy FM, Citi FM, YFM, e-TV Ghana, and Silverbird.